We are all used to unlocking our cars with a remote control, but wouldn’t it be great if you could do the same with your front door? Well now, thanks to Yale you can – with this brand new product only available on new composite doors. Keyfree is the very latest in door security from Yale, and combines peace of mind with convenience by allowing you to access and protect your property without a key. Whether you use the remote control like your car, or enter your own 4-12 digit code into the built-in keypad, Yale Keyfree couldn’t be easier to use – and because it’s brought to you by Yale, you know it’s technology you can trust. With Yale composite doors Keyfree everything’s covered. The unit is powered by it’s own batteries - so even if the power fails it still works, it’s backed up by an override key for emergencies and unless you ask it not to, it will even talk to you as you use it! No more lost keys, no more rummaging in your bag and no more cutting keys for visitors – Yale Keyfree is the perfect way to make your new composite door complete. Feeling safe at all times is a must for any homeowner. Keyfree is enhanced by a number of special features, which ensure that you and your property are fully protected. In case you are worried about exposing your pin, a ‘fake’ pin code system allows you to enter any number of digits to distract any onlookers. As long as you start or end with your pin code, you will be able to access your home. Additionally, the door locks automatically behind you on the latch. You can fully lock the door by lifting the handle.If an intruder tries to attack the lock, it emits an 80-decibel alarm – enough to scare off any would be intruders. You can also arm the inside handle when you leave your home. If the inside lever is depressed the alarm will be triggered. Keyfree has been rigorously tested under extreme weather conditions, a hard-wearing product, fit for external use. Keyfree has been designed to meet Secured by Design − a UK police initiative for safer homes. A nine-volt battery terminal, hidden under the main body, serves as a backup power source. If all else fails, the product can be activated with a fail-safe mechanical key. Security and style go hand in hand – Keyfree makes a stylish addition to your front door. The remote control keyfob has a 10-metre range and is the quickest and easiest way to unlock your home. Keyfree also allows you to create a 4 to 12 digit code via the keypad for everyday use, and create a separate visitor code for those times when trusted friends or family members need to access your home. As well as multiple locking options, Keyfree actually talks to you. The device is enhanced with a voice notification, which prompts you when the door is locked, unlocked and if the battery power is low. A light, located on the interior, also flashes red to indicate that the door is fully locked or warn you when it’s low in power. Keyfree is a stand-alone, battery-operated unit and is designed to last 12 months on average usage (approximately 5 operations a day). 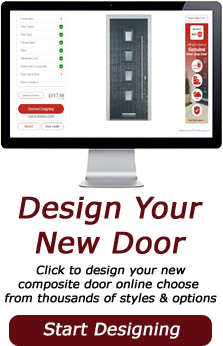 It requires no hardwiring or mains electrical support, which means no fuss or mess – so it can easily be fitted with your new composite door. Will any Keyfree remote control keyfob work with my door? No, the keyfobs are blank when you receive them and once paired, will only work with your lock. There is no worry of another Keyfree user accessing your home. What if I lose my remote control keyfob? If you lose your keyfob, simply contact Yale via the Keyfree website www.yalekeyfree.co.uk. Here, you will be able to order new, blank keyfobs, which will then need to be synchronised to your door. The user guide explains how to do this. You can buy up to four keyfobs for your family. Does Keyfree need to be hardwired? No, it is a stand-alone unit, operated by four AA batteries, therefore you don’t have to worry about electrical connections. I’m worried Keyfree is too complicated. Is it really that straightforward? Keyfree does include a lot of features, but they are all very easy to use, no matter how ‘technology savvy’ you are. All features have been designed to make your life easier, not to make it more difficult. A user guide will also be given to you upon completion of installation. Are there child safety features built-in to the lock? As the door can be opened from the inside at any time, Keyfree can be easily programmed with a “child safety mode”, whereby the door alarm will sound if anyone presses the handle from the inside, alerting you to any risk. Do I have to use the keyfob or keypad every time I go in and out of the door? You can open the door from the inside at any time. To save having to use the keyfob or keypad to continuously open the door, for example when you are unloading shopping from a car, it is easy to programme Keyfree with a “safe passage” mode, so you can go in and out easily and then quickly re-set Keyfree to its normal settings when you are finished. What happens if my lock breaks down? Your door installer can help with any queries or you can contact Yale directly. There is also an out of hours helpline, which is to be used in the event of a lockout. Your user guide also covers all possible situations. Please refer to this in the first instance.